From my very first scarf (which had at least a few holes) to my most recently finished cabled afghan, knitting has served me well over the past 14 years. I’ve made numerous hats, scarves, blankets, flowers, stuffed animals, and even a couple sweaters (though only for babies and dolls). 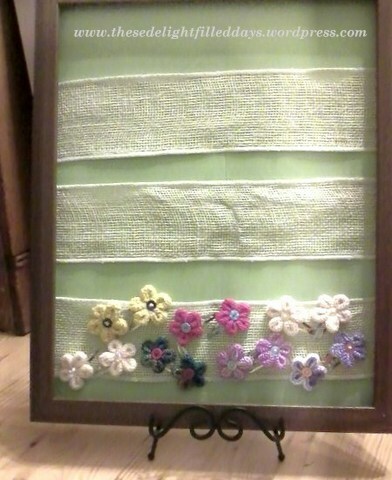 It gives me a way to be creative and do something productive while I watch tv. With it I can make gifts and it gives me a reason to buy pretty yarn when I see it. It’s a relaxing activity and has given me much pleasure. Hopefully the things I’ve created have brought joy to those who’ve received them as well. There’s no way to know how many hours I’ve spent knitting over these year or even how many things I’ve made, and those numbers will only increase as more years go by. Do you have something you greatly enjoy? Maybe it’s a new hobby or something you’ve been doing since you were a child. Perhaps it’s something you’ve set down for a while, even a number of years. Perhaps it’s time you picked it up again. The time has come for my first craft show with an official business and I would be lying if I said I haven’t been a little anxious…actually, at this moment I’m rather calm. However, it’s 10:30 at night and I still have to gather all of my stuff together and have it ready for the morning. I’m just glad I’m not traveling very far to get to the location. Last night I finally created the display I have been thinking about for the last week or so. One thing I enjoy to no end is creating and have henceforth decided that Friday will be set aside to share such creations. Here is my latest: a giant knitted mitten along with a slew of felt animals to go inside. “What a strange thing to make,” you may be thinking. Well, I assure you, it is not so strange if you are up on your children’s literature. I made this set for my niece for her 2nd birthday, giving with it a copy of Jan Brett’s The Mitten. It is probably her most well-know picture book that tells the story of a mitten, dropped in the snow by a little boy as he is going out to play. One by one, the animals find the mitten and cozy their way in with the others to be nice and warm. The story ends with the mouse sitting on the bear’s nose, tickling it and making him sneeze. All of the animals fly out of the mitten just as the boy realizes it’s missing and goes to find it. Boy and mitten are reunited, though one is now slightly larger than the other (one of the mittens, that is; neither of them get to be bigger than the boy). The story is a Ukrainian folk tale (which makes it even more special to me as that is part of my heritage) and the illustrations are intricate and beautiful. There are side panels on each page that show which animal is coming next as well as insets that show where the boy is during the story. 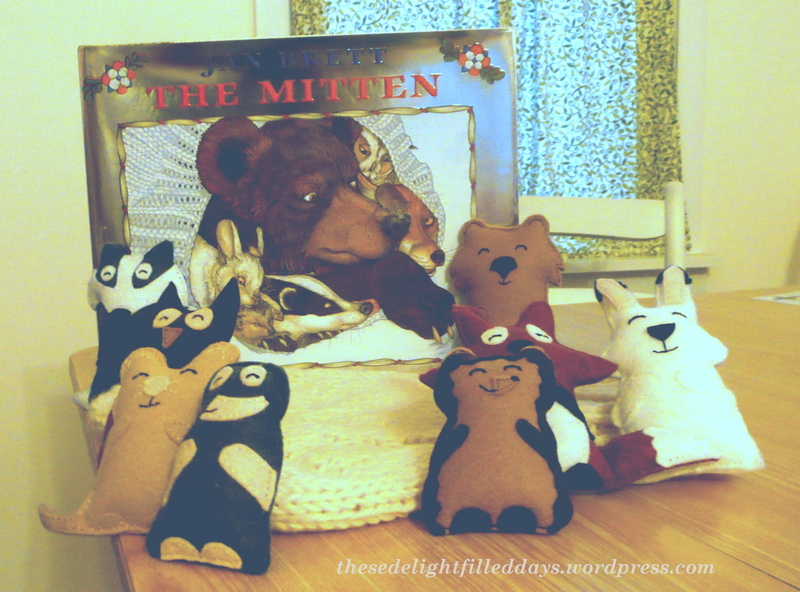 They are so well thought out and executed that The Mitten has earned it’s place on my list of favorite picture books. Now that you’ve had a nice book review, let’s get back to the creating. I had made a mitten for this purpose a few years ago and thought it fortuitous to stumble upon the pattern I wrote up for it when I started on this one. Sadly, after knitting the main piece once, the thumb three times, and trying to sew the thumb at least 4 times, I know I had to find another way. That’s when I remembered this great book at my library: Leisure Arts’ Snow Day Sets to Knit. So, using two strands of DK yarn and size 13 double pointed needles I got to work using the basic mitten pattern and making a few adjustments with the length (the size of the width was just right as written). 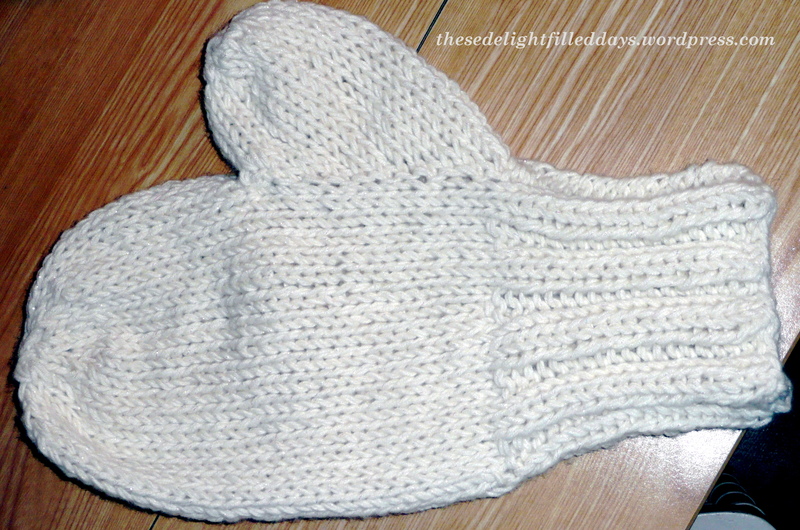 This is how the finished mitten turned out. I like it for the most part, but should I do it again, I might make the thumb a little smaller; it seems to be just a tad too wide. I bought some lovely felt at a local yarn & fabric shop/craft studio. At first I thought it might be too expensive, but when I started working with it I realized that the felt I could have gotten from one of the big chain craft stores would have never held up to both my sewing and a two-year-old playing with it. I found the basic shape I wanted all of the animals to have by searching images on Google and traced them our free-hand from there. For the most part, I cut the felt details on the animals free-hand as well and really couldn’t be more thrilled with how they all turned out. 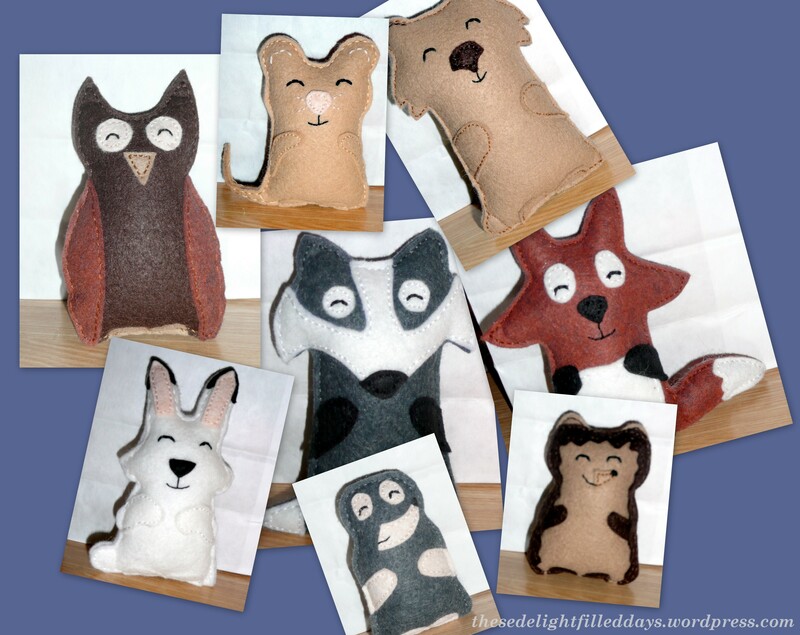 And here they are, top to bottom, left to right: owl, mouse, bear,badger, fox, snowshoe rabbit, mole, and hedgehog. This is what I really love about creating things; when they are your own, you can do them however you want! I’m so thankful that, for the most part, God gave me a desire to create in a way that things don’t have to be perfect when I first start out. They tend to take shape along the way. I guess what I’m trying to say is that if you are making something and it ends up not being “perfect,” it’s ok. It is your creation and you have every right to be proud of it. I do realize that in some crafts “perfection” is important, such as checking your gauge before you start knitting a sweater…this is why I have yet to knit a sweater 🙂 But if you are making, say, a little felt hedgehog, and one ear ends up being bigger than the other, no sweat, he’s still cute, and your 2-year-old niece probably won’t even notice. Plus it makes it unique. It is evidence that these items we craftily create were not bought in a store. I don’t know about you, but I love that as well. Happy creating!